When newborn babies are under stress, their brains show a heightened response to pain, a new study has found. However, you&apos;d never know it from the way those infants act. The findings reported in Current Biology on November 30 show that stress leads to an apparent disconnect between babies&apos; brain activity and their behavior. "When newborn babies experience a painful procedure, there is a reasonably well coordinated increase in their brain activity and their behavioral responses, such as crying and grimacing," says Laura Jones of the University College London. "Babies who are stressed have a larger response in the brain following a painful procedure. But, for these babies, this greater brain activity is no longer matched by their behavior." Because newborns cannot tell us when they&apos;re in pain, doctors and researchers use indirect measures of pain based on behavior. Those measures are sometimes used in the hospital to assess whether a baby needs to be made more comfortable or to be given painkillers. Jones and her colleagues led by Maria Fitzgerald knew that adults under stress frequently report feeling more pain. They wanted to find out in the new study whether that&apos;s also true in infants. 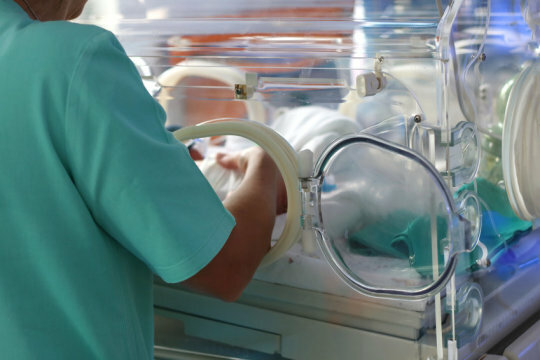 The researchers enrolled 56 healthy, newborn infant boys and girls from the postnatal ward and special care baby unit at the Elizabeth Garrett Anderson Obstetric Wing, University College Hospital. The researchers measured the babies&apos; stress levels based on salivary levels of cortisol stress hormone and heartbeat patterns, both before and after a clinically necessary heel lance. At the same time, they measured the babies&apos; pain response using EEG brain activity and facial expression. The data showed that babies with higher levels of background stress showed a bigger brain reaction to the heel lance procedure. However, that heightened activity in the brain didn&apos;t correspond to a change in the babies&apos; behavior. Jones says that the effects of stress on the brain response didn&apos;t come as a surprise. But they hadn&apos;t expected that the babies&apos; behavior wouldn&apos;t follow the same trend. In retrospect, however, the Fitzgerald lab had found before that behavior and brain activity in infants aren&apos;t always related. "Now we have a greater understanding of what may cause this dissociation," Jones says. Jones says that the findings offer yet another reason to treat and care for babies in ways that minimize both pain and stress. Stressed babies may not seem to respond to pain, even as their brain is still processing it. "This means that caregivers may underestimate a baby&apos;s pain experience," Jones says. In fact, neonatal doctors and nurses know that preterm babies sometimes "tune out" and become unresponsive when they are overwhelmed. The new findings seem to confirm those clinical observations in full-term infants. The researchers say they plan to explore in future studies how other environmental factors and previous experiences, such as interactions between mother and baby, influence the way newborns process and experience pain.